To provide every underprivileged (and tribal) child in Odisha the right to play that ensures their holistic development and fosters their growth as confident and competent learners, as well as to support those that have the talent and desire, to excel at an elite level. Pro Sport Development (PSD) initiated the Khel Vikas project in 2012 in partnership with globally renowned rural development organisation, Gram Vikas. 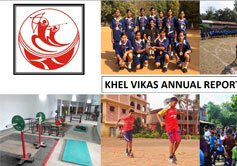 Khel Vikas, sought to provide underprivileged and tribal youth in the state of Odisha access to participation in regular recreational and competitive sport as well as supporting highly talented and motivated athletes in their quest to achieve sporting excellence. Program development, implementation, monitoring and review of Physical Education programs in the 4 Gram Vikas schools catering to 1,300 children. Program development, implementation, monitoring and review of 25 After-School Sports Programs across 7 schools in three districts of Odisha, working weekly with 475 children in 8 sporting disciplines. Coaching and managerial support to the After-School Sports Programs in skill training, nutrition, strength & conditioning, sports science, psychology and injury prevention. Management and administration of the Khel Vikas project. Training and development of 100 coaches and physical education teachers. As part of Khel Vikas, PSD established a Centre of Sporting Excellence for residential athletes in the sport of Olympic Weightlifting. Equipped with Olympic-standard equipment, the Centre also provided on-site physiotherapy, nutrition advice and sports science support. 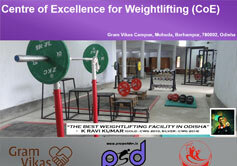 The Centre played host to the Odisha State Weightlifting Championship 2014-15 for Youth, Junior and Senior Categories in November, 2014.